SAN ANTONIO, Tx. -- A VA hospital granted a Vietnam War veteran's last request to see his beloved horses before passing away. Roberto Gonzalez, from Premont, Texas, was drafted in 1970 and shot within four months of serving in Vietnam. The resulting injuries left Gonzalez paralyzed. "That did not stop Mr. Gonzalez from his passions, ranching and horses," Lupe Hernandez of the South Texas Veterans Health Care System told ABC News. "He was the only paralyzed race horse trainer in Texas. He trained and raced horses for 30-40 years." Hernandez explained that because Gonzalez knew that the end was near, he requested to see his horses one last time. 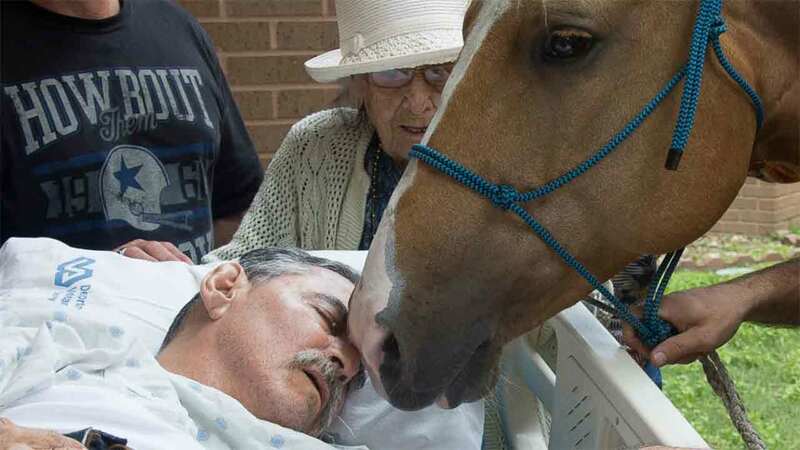 His family brought two horses, "Sugar" and "Ringo", to the Spinal Cord Injury Center at the Audie L. Murphy Memorial Veterans Hospital in San Antonio. The horses brought comfort to Gonzalez, who remains in critical condition. Gonzalez was one of the first patients at the VA Hospital when it first opened in 1974.